FROM symbols of purity to reliable sheath, and rather recently, fashion accessories. 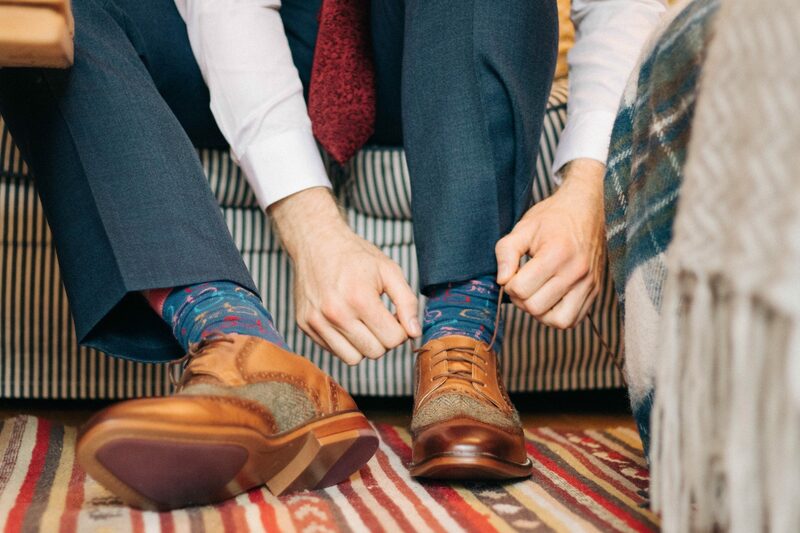 The humble sock has come a long way, and is a staple of almost every male ensemble. We chart the modern history of socks using some of the latest offerings from high fashion and streetwear brands. Spoiler alert: it generally goes long to short. The earliest socks were hand-knitted from wool and were used in protective capacity.Until nylon and elasticity were introduced, gents of station had to wear these socks with garters – or risk looking sloppy with bunched-up rolls. We’re sure no one was really happy wearing the prickly, roughspun things that had to be held up with Christian Grey’s leather refuse pile. Then the 70s came, and basketball – the same televised sport that popularised the runner’s shoe / sneaker – helped spread the trend of over-the-calf socks across the globe. They went by a simpler name: ‘tube socks’. Even today, these socks are apt in cold weather, or for wear with shorts – read through the end to find out why. Full-length tubes eventually fell out of vogue as athletes turned to compression pants. But the slightly shortened variation remained an integral part of any man’s formal look. This gave rise to a golden era of tastefully patterned socks, the most common being checkerboard (above), herringbone (interlaced rectangles), argyle (a sort of plaid with intersecting lines) or birdseye (the hypnotic diamond pattern). Good times. These versatile picks should form the core of your collection if you suit up regularly. The problem with ankle socks is that they exaggerated the irregular shape of the arch on a human foot, and at times just let slivers of ankle flash. Highly distracting, never flattering. As a species, we made some bad fashion decisions in the ’80s and ’90s. But no day was darker than when newly-minted MTV stars began slipping on anklets – half-assed socks hitherto worn mostly by little girls. Turns out bad taste – like questionable music – spreads like wildfire, and soon this waste of fabric was everywhere. They still are. We may or may not have owned a few pairs. You’ll never find out. The only acceptable use case of ankle socks these days are highly-specialised examples (such as runner-specific types with a rubberised neck) built for athletes. Mr Porter’s stock of Paul Smith no-shows are exactly what your collection should look like – even if they’re not seen most of the time. As if in repentance for the ankle sock, some of us quickly learned to submerge our sock lines. Others hopped aboard the psychedelic Happy Sock train. No-show socks for men were widely deemed as a little feminine, but a little help from Hollywood bigwigs like Orlando Bloom, they soon became another avenue of style expression… especially if you had defined or sculpted ankles thanks to your athletic pursuits. Every man needs a host of these to go with both sneakers and dress shoes. Be sure to pair colours sensibly – they’re still visible from time to time. You don’t want to mix loud colours with a sombre suit, or fail to finish a vibrant look with some striking tips. Thom Browne’s latest sock line-up. Socks with height were thrown back into the limelight thanks to designer Thom Browne’s stunning and bold rework of the male suit. Working in soft textures like wool or flannel into fitting get-ups got the world’s attention. Landing Michele Obama’s inauguration suit as a gig didn’t hurt, either. Browne later outdid even himself, swapping out out full-length pants for shorts (and later skirts), allowing the high striped or motif-laden sock to be displayed in all its glory after years of playing second fiddle and peeking out from behind an overbearing pants leg. Turns out good taste, innovation and whimsy can coexist and prevail – let’s keep it this way.